Summary: In the bracelet DIY project, we present you a fine way to do a love heart design friendship bracelet, very simple and cute for lovely girls! If you feel crumby in rainy days, you may want to find something interesting to do. Here's an easy rainy day craft idea for you- a cute love heart friendship bracelet. All you need are 2 colored nylon strings, a pair of scissors and a lighter. OK, let's get started to do this heart pattern friendship bracelet. 6th, repeat to make another V shape with red strand. 6th, braid red strands from sides to center, so the heart shaped pattern is finished once. 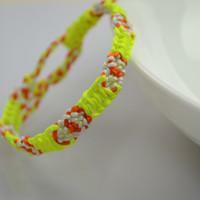 Our heart design friendship bracelet ends up now. Even in the dull and gloomy days, you can harvest joviality and happiness from handmade craftworks. Have a try!